Every beach fanatic has driven by the beach and wished they had a home near the coast. As convenient as it is to live right by the water, there’s a lot you’ll have to keep in mind such as water resistant and easy-to-clean flooring. When living near the beach, you can expect water and sand to make it into your home. With the right flooring to eliminate the extra hassle, you’ll find that it’s easier to manage and maintain year-round. Below we’ll recommend some of the best options to consider for your beachfront home or getaway. Tile flooring is vast in its varieties, giving you the option of porcelain, ceramic, mosaic, vinyl, travertine, and so many more! As for your beachfront getaway, consider ceramic tile. Ceramic tiles provide easy maintenance and durability. Not only are there wood-like tiles, but they come in various sizes to customize the style of your home. Also scratch and moisture resistant, ceramic tiles will be a good flooring choice for young ones. Luxury vinyl flooring has become increasingly popular and will fit perfectly in a beachfront home. In addition, vinyl installation is easy and affordable. Very water resistant, vinyl is ideal for moisture prone areas in your home. You can order your vinyl in planks or tiles, giving you options that will suit your style preference. Unlike harder flooring surfaces, vinyl offers a softer underfoot and dampens the sound in the room. Fitting in nearly any kind of space, hardwood flooring is a prime choice for families. Ironically, wider planks make for easier cleaning rather than smaller planks. 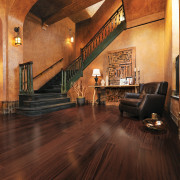 With its strength and durability, hardwood is able to be refinished and built to last for many years. Additionally, they come in all kinds of colors whether you want to create a dark or bright living space. When it comes to sound, hardwood provides excellent acoustics for the room. Another benefit of hardwood flooring is that it can add value to your property. If you plan on selling your home in the near future, buyers will most likely pay more for a house that has hardwood rather than carpet, for example. Stone tiles such as, limestone, granite, travertine, and marble are a luxurious alternative. These kinds of flooring fit especially well in areas such as bathrooms and kitchens. On top of their refined and elegant features, stone tiles are also easy to clean and require little maintenance. 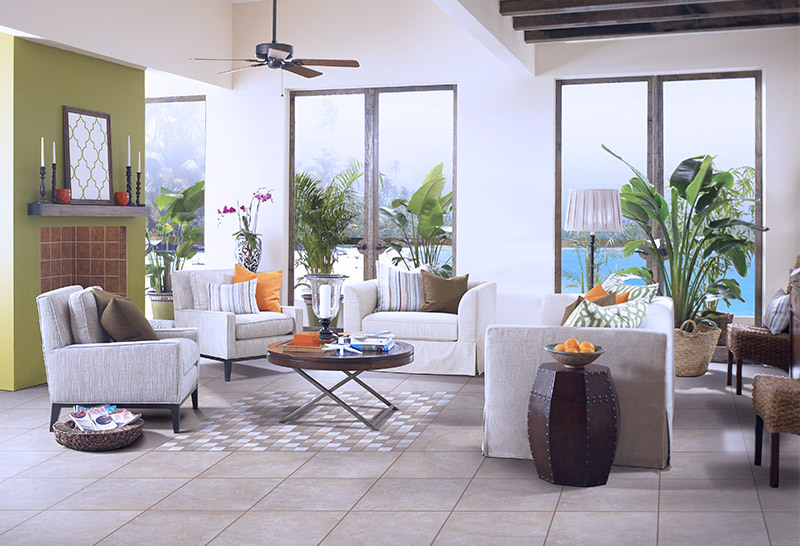 In warmer climates such as here in Florida, stone tile flooring helps to keep temperatures lower in your home. Finally, stone tiles can add value to your beachfront property as well. Whenever you’re ready to renovate your home, choose Go Mobile Flooring to do the job. For any questions about what we offer or installation, visit our website or give us a call. For neighborhoods in the Tampa area, our mobile showroom is ready to present all the flooring varieties we install here at Go Mobile Flooring. consultants are available right now.